It is being reported that after oral arguments were finished back in March, Supreme Court Chief Justice John Roberts was planning to join with the other conservative justices in ruling that the individual mandate in Obamacare was unconstitutional. But something changed. According to Jan Crawford of CBS News, two sources with “specific knowledge” of the deliberations at the Supreme Court told her that at some point Roberts switched his position and decided to uphold Obamacare. Roberts decided to characterize the penalty for not complying with the individual mandate as a tax. This argument had been rejected by the lower courts and supporters of Obamacare had considered that argument to be essentially a legal “Hail Mary” with almost no chance of success. But this is how the legal system in America works. Judges decide what they want the result of a case to be, and then they try to figure out a way to justify it under the Constitution and under existing law. Often, judges will go through all sorts of mental gymnastics to get to the results that they want. Most Americans would be absolutely shocked if they truly realized what goes on behind closed doors in our legal system. 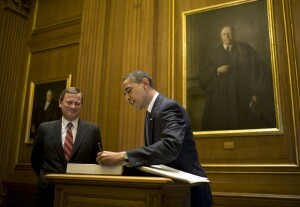 Chief Justice John Roberts did not wake up one day and suddenly realize that Obamacare was constitutional. Rather, he bowed to political pressure and then attempted to find some possible way to legally justify his new position. Normally, Supreme Court deliberations are very secret. But in this case details of what happened have been leaked to the press. The following is what reporter reporter Jan Crawford recently told Face The Nation…. So exactly why did he change his mind? Well, according to CBS News it had a lot more to do with politics and the media than it did with legal issues…. But Roberts pays attention to media coverage. As chief justice, he is keenly aware of his leadership role on the court, and he also is sensitive to how the court is perceived by the public. There were countless news articles in May warning of damage to the court – and to Roberts’ reputation – if the court were to strike down the mandate. Leading politicians, including the president himself, had expressed confidence the mandate would be upheld. Some even suggested that if Roberts struck down the mandate, it would prove he had been deceitful during his confirmation hearings, when he explained a philosophy of judicial restraint. It was around this time that it also became clear to the conservative justices that Roberts was, as one put it, “wobbly,” the sources said. When determining the outcome of a case, Supreme Court justices should be using the U.S. Constitution as their guide. But instead, these days they let all kinds of other things influence their decisions. There are also hints that John Roberts changed his vote in the way that the dissenting opinion is drafted. The following is one of the clues in the dissenting opinion that was pointed out by the Volokh Conspiracy…. Notice also that his response to Roberts is tacked on at the end, rather than worked into the body of whatever he was writing (see page 64 of his dissent). For example, one would have expected Scalia to directly take on Roberts’ application of the Anti-Injunction Act, but his brief section on that act only mentions what “the Government” argues (see pages 26-28). You can find more discussion on this right here. Sadly, this Obamacare decision is just more evidence of the lack of respect for the U.S. Constitution in our legal system today. In law school, I was taught that the U.S. Constitution is a “living, breathing document” that must evolve as society evolves. This sick philosophy is being taught in almost every law school in the United States. The idea is that our society is “growing” and “progressing” and that the elites of today know how to run things far better than the founding fathers of this country did. When John Roberts was originally nominated to be a Supreme Court justice, I tried to warn people that his record clearly indicated that he was one of these “progressives” that did not have respect for the U.S. Constitution. I tried to warn people that he would be a horrible Supreme Court justice. Unfortunately, at the time I did not have my websites and so my warnings did not go very far. 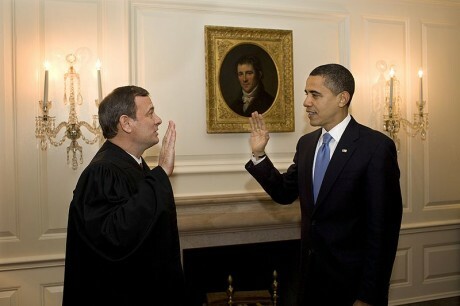 Now, it has become very apparent to everyone exactly what Chief Justice John Roberts is. Sadly, law schools are producing hordes of new graduates just like him with each passing year. Our law schools do not have respect for the U.S. Constitution and they openly teach that it must “change” as society changes. If we continue down this road, eventually the U.S. Constitution will be totally destroyed. Nobody is going to rip it up or set it on fire, but it will be destroyed because all of the meaning will have been sucked out of it. People will still call it “the Constitution”, but we will not follow what it says. If you still believe in the U.S. Constitution, then you need to stand up and be counted, because right now our Constitution is under attack like never before. They Are Turning Our Crops, Animals And Even Our Babies Into Freakish Genetic Monsters – What Could Go Wrong?